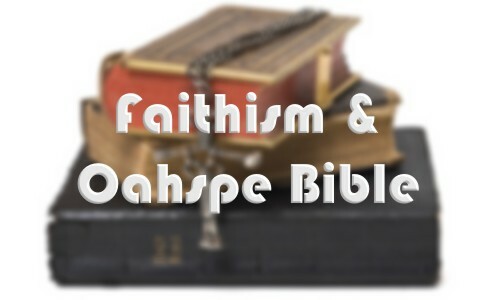 What Is Faithism And The Oahspe Bible? What is Faithism? Have you read about it before? What about the Oahspe Bible? The Bible makes it clear that it is “by grace you have been saved through faith. And this is not your own doing; it is the gift of God, not a result of works, so that no one may boast” (Eph 2:8-9), however, just because it’s free doesn’t mean it’s cheap. In fact, it wasn’t free to the Father or the Son of God. It was as costly as anything that has ever been paid because just one tiny drop of the precious blood of the Lamb of God is the most valuable thing in all the universe. The gift is free to us, but it cost Jesus His life, but that was also His purpose in coming, as He said, “the Son of Man came not to be served but to serve, and to give his life as a ransom for many” (Mark 10:45). Obviously “many” doesn’t mean all since there will be many will claim Jesus as Lord, but tragically, they will find out that they were wrong (Mat 7:21-23), therefore, it is critical for us to know how we are to be saved. God must grant repentance and then this repentant heart will seek to please God, and it is very pleasing to God to believe in His Son, Jesus Christ. That is the faith that saves, but what about “Faithism?” Have you heard about this? Let’s find out why we need to be warned about “Faithism.” Is what they call, “new revelation,” truly from God? Well over a century ago, dentist, John Ballou Nebrough wrote a new Bible, called the Oahspe Bible? His claim in this 1882 book was that there was new, fresh revelation from God, but where did it come from and why was there new revelation needed? Especially since we already have the Bible? Anyone who claims to have received “new revelations” from God should be warned that God has already revealed all we need to know as far as being saved and being used by God as a means to save others. It’s like telling God, “Paul’s Book of Romans is great, but it’s not quite enough. Anyone that believes we need “more revelation,” and/or claims to have new revelations from God, should immediately raise a red flag in our minds. Let’s be clear as far as the teachings of the Holy Bible are concerned. If it’s new, it’s not from God, and if it’s from God, it’s not new. Solomon is right in saying, “What has been is what will be, and what has been done is what will be done, and there is nothing new under the sun” (Eccl 1:9). God’s Word doesn’t change. It doesn’t need to. It is complete in every way. It’s not the Bible plus this, but nothing but the Bible. We don’t need to receive new revelations from human beings (even if they claim it’s from God) because we already have more than enough revelation in the Bible to save us (Acts 4:12) and others (Matt 28:18-20; Acts 1:8). This is actually not a new thing to have someone claim to have new revelation. Cults have come and gone who claimed to have brand new revelations from God, some still exist, but they teach about another Jesus and not the Jesus of the Bible. Jesus has spoken to us through His word, just as the author of Hebrews tells us; “Long ago, at many times and in many ways, God spoke to our fathers by the prophets, but in these last days he has spoken to us by his Son, whom he appointed the heir of all things, through whom also he created the world” (Heb 11:1-2). That’s why Jude wrote “I find it necessary to write appealing to you to contend for the faith that was once for all delivered to the saints” (Jude 1:1b). It has been delivered, once and for all. The past tense in the Book of Jude and the Book of Hebrews is clear. It was done…once and for all, most recently by Jesus Christ. Let Jesus Christ’s warning ring clear to all who have these “new revelations”; “I warn everyone who hears the words of the prophecy of this book: if anyone adds to them, God will add to him the plagues described in this book” (Rev 22:18), and even since the ancient days, God has warned, “You shall not add to the word that I command you, nor take from it, that you may keep the commandments of the LORD your God that I command you” (Deut 4:2), so “not add to his words, lest he rebuke you and you be found a liar” (Prov 30:6). In Dr. Newbrough’s invention, the Oahspe Bible was supposed to be written while he was under a hypnotic trance, in what he calls a “spiritual technique,” but this open mindedness is dangerous. Who leaves their doors and windows unlocked at night? That’s just asking for an intruder to come in, and so by emptying the mind and entering into the “spiritual realm,” a person can open themselves up to just about anything, including demonic attacks and even possession for the unsaved. Being in the “spiritual realm” is a “house swept clean” ready for demonic company (Luke 1:25-26). In his Bible, Newbrough claims to have been shown how the Creator created the worlds, but there are other worlds too in his mind. They are called, ATMOSPHEREA AND ETHEREA, and apparently, there is more than one heaven. His Bible claims to reveal the “manner and glory and work that the spirits of the dead enjoy” and individual spirit eventually becomes an angel. This is very troubling because some people believe it. “Faithism” stems from the teachings of the Oahspe Bible and teaches some “strange doctrine.” For example, it is taught that those who eat meat will automatically be placed in the lowest of several different heavens. Even though this is unbiblical, he crosses over into heresy where Newbrough teaches that even the most evil of souls will gradually make it into the higher realms of the heavens. His teaching is very much a “works-based” faith and not strictly the free gift of God alone. Why did we write this article? I believe we are better off being forewarned and then forearmed that not knowing about it at all. If we know the enemies tactics, then we’ll better understand how to bring those who are in error to the truth Himself (John 14:6). Truth comes from God because He is the truth, and only the Holy Spirit can convict them of their sins and then bring them to repentance. After all, if they put their trust in Christ, they will see the light and the error of their way. God may use us in the process of bringing others out of error, just as we bring others out of the darkness, unto the Light of the World (John 18:12). It’s never about debating or arguing them out of a cult or false teachings; it’s all about lovingly speaking the truth and praying for them that God might show them their desperate need for saving and they run to the cross and trust in the Savior. No one was ever argued or debated into heaven that I know of. I’d rather lose an argument and win a soul than win an argument and lose that soul. Take a look at this article too: How Can We Recognize False Doctrine? Thanks for the warning. I have not heard of either of these. Any type of “new” anything pertaining to the Bible sets off alarms for me. I am quite happy with the KJV and the ESV versions of the Bible. It is God’s Word. Nothing more is necessary. God said it, and that settles it. Thank you Patrick. I am with you. Next post: How Should Christians Deal With Mental Illness?